A fake Ferrari sports car made in Thailand has become the centrepiece of an exhibition in Brussels warning against the dangers of pirated goods. 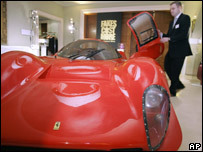 The Ferrari P4 - of which only three were made, in 1967 - was made in a back street factory in Thailand and is powered by a Subaru engine. The Authentics Foundation has used the car to warn against the growing tide of counterfeit goods. It says pirated medicines and food pose a real threat to human health. "I think this all maybe started with the DVDs and music being pirated and it has just exploded, basically, into something quite different," said model Yasmin Le Bon, an anti-counterfeit campaigner. European Commission President Jose-Manuel Barroso gave his support to the campaign. "It is indeed not only an economic problem; but a public health and a consumer problem," Mr Barroso said. Authentics Foundation president Timothy P Trainer said: "It has got more complicated because now counterfeiters are into everything. Twenty years ago they were more into luxury brands and so on. "Today, they are into electronics, they are into medicine, they are into food." The foundation said as much as 80% of the pharmaceuticals sold in Nigeria are fake.